Pain located over the hip joint is commonly caused by inflammation of the multiple bursae protecting the bony protrusion near the skin. A bursa is a fluid filled pouch designed to form a cushion where there are areas of potential friction and when inflammed is known as a bursitis. Hip bursitis are not uncommonly seen in long distance runners and occur with repetitive strain to these bursa. Often it is associated with a tendonopathy (degenerative changes to a tendon) of the gluteus medius muscle and it is necessary to manage both in tandem. 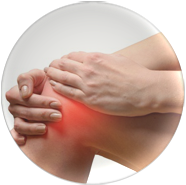 It is also commonly associated with osteoarthritis of the hip joint. The most common reason for these problems to develop is abnormal or altered pelvic biomechanics. Biomechanics is the study of how forces produced by muscles and the environment interact with the body. The pelvis should maintain a solid foundation from which the legs and spine can effectively create movement. When there is an inherent weakness within the pelvic musculature then this stable platform is lost. As fatigue sets in with prolonged activity then so this instability increases. 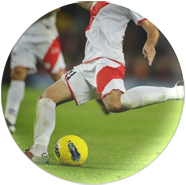 The pelvis no longer provides a suitable base from which to work and so associated muscles need to work harder to compensate. It is this unaccustomed increased workload and instability that leads to the tendonopathy and bursitis as described. 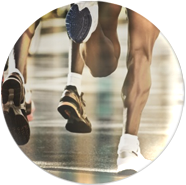 Treatment should involve an assessment of running style (gait analysis) to define the abnormal biomechanics. Usually the bursitis is so painful that it prevents the rehabilitation process and under these circumstances it may be appropriate to treat with a cortisone injection or extracorporeal shockwave therapy to ease symptoms. However it is always important to consider other potential causes of hip pain such as referred from the lower back, hip joint injuries and stress fractures of the bone. If in doubt consult with a medical professional.